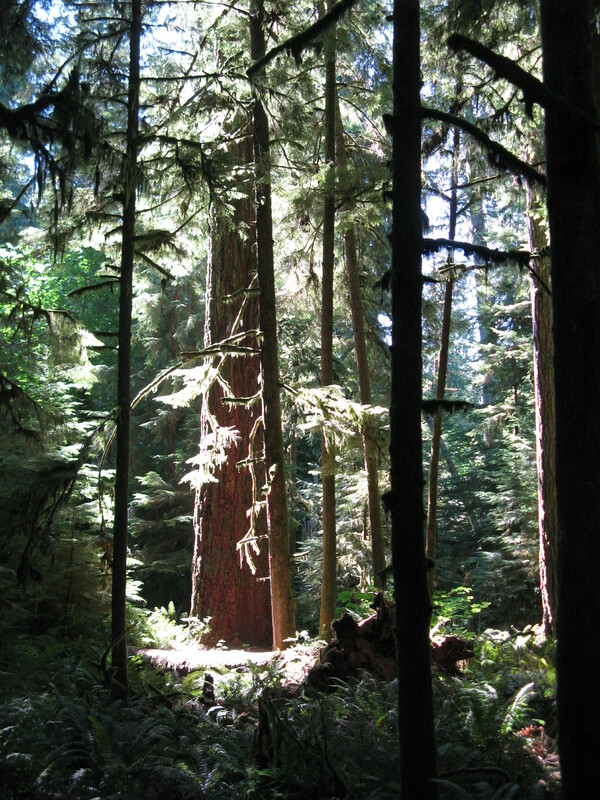 Cathedral Grove on Vancouver Island is a stand of ancient Douglas Fir and Cedar. Some are over 800 years old. In my neck of the woods (pun intended), a tree hugger is a hippie environmentalist out to save old growth forest from falling by chainsaw. There is another kind of tree hugger as well. This kind is just as concerned for the well being of trees and it is because of the energy they give off. Let me explain. Scientist have proven that everything on the planet is made up of energy. Some things, like inanimate objects vibrate at a very low level while living things, vibrate at a higher rate. Even little kids who watch Sesame Street learn that plants and trees are living things. So it makes sense that trees vibrate at a higher level. 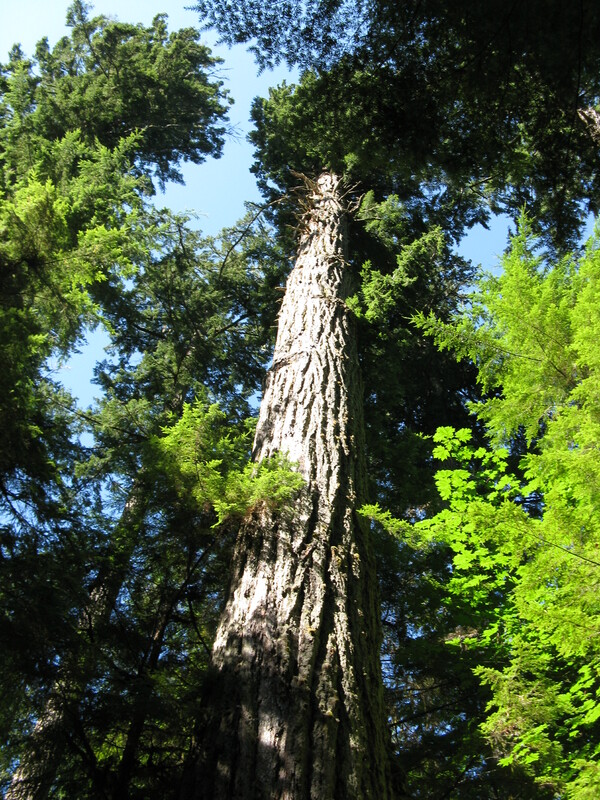 Tree’s energy is unique in that they are intricately rooted to mother earth while reaching skywards connecting the heavens. They are the lungs of the earth, filtering the pollution that the world produces and releasing clean oxygen back into the atmosphere. Trees give us food, fuel, timber, medicine, and even shelter from the elements. They are the standing giants. With all they give us there is something that ancient cultures understood about trees that modern culture is just starting to realize. Trees are wise. Imagine what kind of wisdom you would have if you were a 500 year old tree connected to the universal energy flow for all those years as well as having your roots grounded in the earths awesome power. Being close to or touching a tree for a short length of time can produce a calming effect, alleviate headaches and improve clarity of mind. Have you ever gone for a walk in the woods and came back with a feeling of wellbeing? Studies have shown that children who have regular access to playing in wooded or green environments function better cognitively. Nature is wonderful medicine. The easiest way to get a calming benefit from a tree is to first find the largest one available in your vicinity. Think of it this way, the largest one is also probably the oldest one. The older the wiser. Either embrace the tree in a big hug aligning as much of your body with the tree, or if this is a little weird for you, sit at the base of the tree with your back pressed up against it. Empty your mind of thought and just be with the tree. Let the energy field that is vibrating from the tree blend with your own bodies life force. It will strengthen you with positive energy. Inhale deeply. That is the purest air available that you are breathing in. It will stimulate your blood with clean oxygen. When you have reach your desired level of calm, mentally thank the tree and release. Thanking the tree is good karma. Even trees like to feel appreciated! What really matters is knowing that trees are singing at all. Need more proof that trees are intelligent living entities? Go to http://www.themindunleashed.org/2013/07/tree-hugging-now-scientifically.html to watch this video from a research eccovillage in Italy that has developed a way for plants to communicate through electrodes connect to their leaves and to a synthesizer computer program. It’s pretty amazing! People are not the only living being on this earth that can have wisdom. Wow! That’s some tree you are hugging! I definitely have tree envy!